View our feature on Kathleen Norris’s Acedia & Me . Kathleen Norris’s masterpiece: a personal and moving memoir that resurrects the ancient term acedia , or soul-weariness, and brilliantly explores its relevancy to the modern individual and culture. Kathleen Norris had written several much loved books, yet she couldn’t drag herself out of bed in the morning, couldn’t summon the energy for daily tasks. Even as she struggled, Norris recognized her familiar battle with acedia. She had discovered the word in an early Church text when she was in her thirties. Having endured times of deep soul-weariness since she was a teenager, she immediately recognized that this passage described her affliction: sinking into a state of being unable to care. Fascinated by this “noonday demon,” so familiar to those in the early and medieval Church, Norris read intensively and knew she must restore this forgotten but utterly relevant and important concept to the modern world’s vernacular. 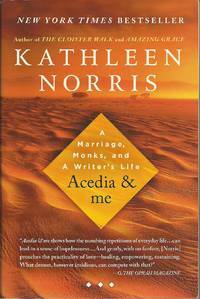 Like Norris’s bestselling The Cloister Walk , Acedia & me is part memoir and part meditation. 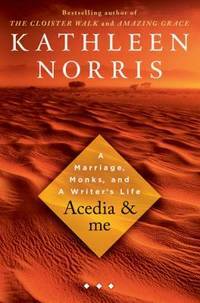 As in her bestselling Amazing Grace , here Norris explicates and demystifies a spiritual concept, exploring acedia through the geography of her life as a writer; her marriage and the challenges of commitment in the midst of grave illness; and her keen interest in the monastic tradition. 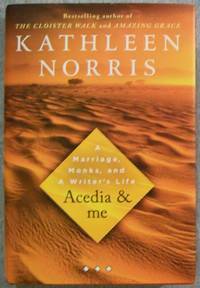 Unlike her earlier books, this one features a poignant narrative throughout of Norris’s and her husband’s bouts with acedia and its clinical cousin, depression. Moreover, her analysis of acedia reveals its burden not just on individuals but on whole societies— and that the “restless boredom, frantic escapism, commitment phobia, and enervating despair that we struggle with today are the ancient demon of acedia in modern dress.” An examination of acedia in the light of theology, psychology, monastic spirituality, the healing powers of religious practice, and Norris’s own experience, Acedia & me is both intimate and historically sweeping, brimming with exasperation and reverence, sometimes funny, often provocative, and always important. Riverhead Books. Hardcover. 1594489963 Good condition ex-library book with usual library markings and stickers. . Good. Riverhead Books. Hardcover. 1594489963 Item in very good condition! Textbooks may not include supplemental items i.e. CDs, access codes etc... . Very Good. Riverhead Hardcover, September 2008. Hardcover . Used - Acceptable. Moderate wear due to note taking and underlining. May have minor sticker residue or marks or writing. Our service is second to no other seller because we use easy to remove inventory tags and try to ship every day so your book arrives quicker! As a small independent book store in the Midwest we thank you for the support. Satisfaction guaranteed in all transactions. Let us know what we can do to help! Riverhead Books. Hardcover. GOOD. Spine creases, wear to binding and pages from reading. May contain limited notes, underlining or highlighting that does affect the text. Possible ex library copy, thatâll have the markings and stickers associated from the library. Accessories such as CD, codes, toys, may not be included. Penguin Publishing Group, 2008. Hardcover. Very Good. Disclaimer:A copy that has been read, but remains in excellent condition. Pages are intact and are not marred by notes or highlighting, but may contain a neat previous owner name. The spine remains undamaged. An ex-library book and may have standard library stamps and/or stickers. At ThriftBooks, our motto is: Read More, Spend Less.Dust jacket quality is not guaranteed. Penguin Publishing Group, 2008. Hardcover. Acceptable. Disclaimer:A readable copy. All pages are intact, and the cover is intact. Pages can include considerable notes-in pen or highlighter-but the notes cannot obscure the text. An ex-library book and may have standard library stamps and/or stickers. At ThriftBooks, our motto is: Read More, Spend Less.Dust jacket quality is not guaranteed. Penguin Publishing Group, 2008. Hardcover. Good. Disclaimer:A copy that has been read, but remains in clean condition. All pages are intact, and the cover is intact. The spine may show signs of wear. Pages can include limited notes and highlighting, and the copy can include previous owner inscriptions. An ex-library book and may have standard library stamps and/or stickers. At ThriftBooks, our motto is: Read More, Spend Less.Dust jacket quality is not guaranteed. Penguin Publishing Group, 2008. Hardcover. Acceptable. Disclaimer:A readable copy. All pages are intact, and the cover is intact. Pages can include considerable notes-in pen or highlighter-but the notes cannot obscure the text. At ThriftBooks, our motto is: Read More, Spend Less.Dust jacket quality is not guaranteed. Riverhead Hardcover. Used - Good. Shows some signs of wear, and may have some markings on the inside. Riverhead Hardcover. Used - Good. Ships from Reno, NV. Shows some signs of wear, and may have some markings on the inside. 100% Money Back Guarantee. Shipped to over one million happy customers. Your purchase benefits world literacy! Riverhead Books, 2008-09-16. Softcover. Very Good. Paperback Advanced Reading Copy. Paperback Plain cover pre-release first-edition. Artwork black and white, some artwork and images might be missing. Copy not final and there may be typos. Riverhead Books, 2008. Hardcover. Good/No Jacket. Riverhead Hardcover, 2008. Hardcover. Good. Hardcover. Sound & nice copy, light to moderate edgewear, remainder mark. Jacket has moderate rubbing/edgewear. Not price clipped. Riverhead Hardcover, 2008-09-16. Hardcover . VeryGood/very good. A nice copy. Clean text, solid binding. New York: Riverhead Books. Fine copy in fine dust jacket. 2008. 1st. hardcover. 8vo, 334 pp. .
New York: Riverhead Books, 2008. Dj has very light edgewear. Light wear. Nameplate on inside front cover. Very light soiling. . Hard Cover. Very Good/Very Good. 8vo - over 7¾" - 9¾" tall. Riverhead Books, 2008. 2nd Edition. Soft cover. Very Good. Stirring, intimate, and historically sweeping, Acedia & Me brims with exasperation as well as reverence, and is unexpectedly funny, often provocative, and always important and wise. ""A bracing and enlightening journey."" Soft cover in very fine condition. Text block clean and tight. No markings noted. First Edition per numbers line.